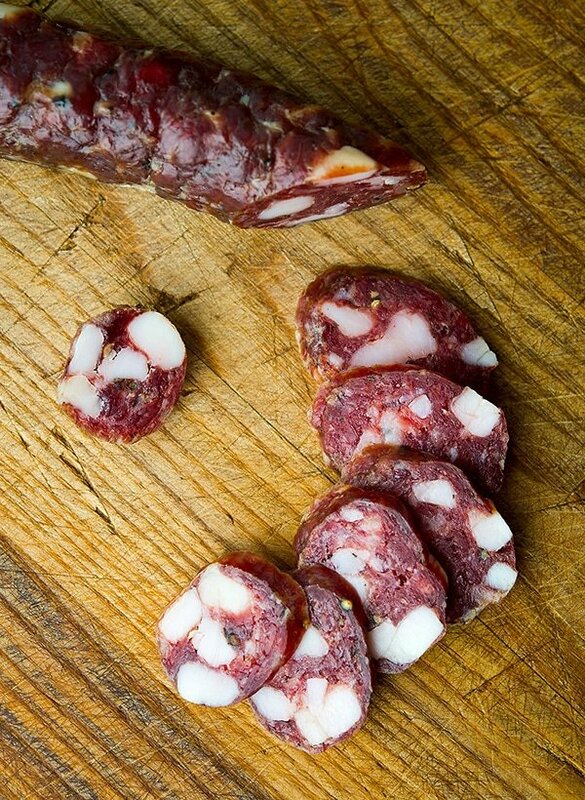 Every salami-making culture makes a version of this sausage, and recipes are similar whether you look to Spain or France or Italy or Hungary or Germany — although these last two nations tend to smoke their salami, too. If you’ve never made fresh sausages before, bookmark this recipe and come back when you’ve made a dozen or so batches. You need to be comfortable with the basic sausage-making process before you take the step of curing them. You also need some special equipment. Don’t try to shortcut salami making. You will pay for it eventually. First, ya gotta have a good grinder. For small batches I use the KitchenAid grinder attachment, but with anything larger than 5 pounds, I use a Weston grinder. You need a sausage stuffer, too. My stuffer of choice is this one from The Sausage Maker. It’s no-frills and there may be better ones out there, but this model has not failed me in more than 10 years. Can you hand-cut the meat and fat? Yes, but it requires a sharp knife and an awful lot of patience. To hang your sausages for the few days it takes to ferment them, I use a simple wooden clothes rack. I also buy “S” hooks from the local hardware store to hang the links. You’ll also need a humidifier both for the fermentation process and while your links are drying. I use this one , and it’s worked well for me for 3 years now. 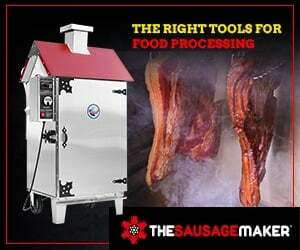 Finally, you must have a curing chamber; The Sausage Maker has a good tutorial on making one here. The salami-making process is this: You make sausage, only with added sodium nitrate (Instacure No. 2) and a starter culture, then ferment the sausages at room temperature for a few days to let the good bacteria in the starter beat back any bad bugs within the meat. Do you need these? Absolutely. Yeah, I hear you: “But can’t salami be made without them?” Yes. But you can’t. The people who can work in places where they’ve made salami for decades or even centuries, and the ambient air has the good bacteria already; it’s like a sourdough. For you and me, nitrate and starter culture is an insurance policy against botulism and listeria. The last stage is to hang the links to dry out slowly in the chamber or in a basement. The key to successful drying is to let the sausages dry slowly, little by little. Why? This does two things: First, you prevent the dreaded “case hardening,” where the outside of the salami dries too fast and prevents the interior from drying properly. And second, the longer you cure your salami, the better it will taste. 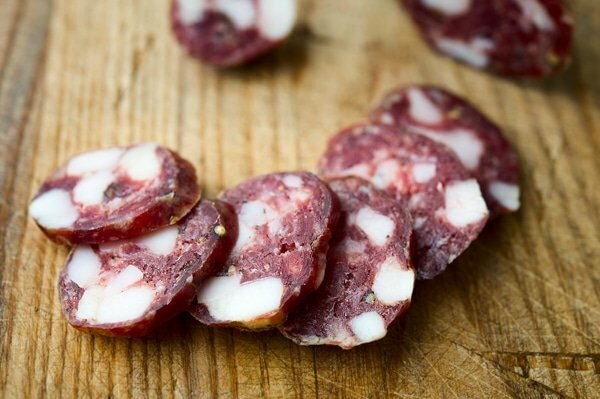 Truly great salami has a distinct funk to it, like cheese. I’ve made a lot of decent salami, some mediocre and a few crappy ones. Only once in a while does everything work perfectly. The batch of wild boar salami in these photos was one such time. I cured these links for more than 2 months, with slowly decreasing humidity until they had that sweetish meat funk we all know and love. Don’t know what I am talking about? That’s because 90 percent of all salami made in the United States is not cured long enough. It’s fine, but hasn’t had the time to develop. We Americans are always in a hurry. Follow this recipe, get decent equipment, and you should be fine. But remember: Sausage making is a sprint, salami making is a marathon. You must be careful and clean at the start — remember we’re dealing with raw pork here — and you cannot forget about your salami while it cures or you may be very, very sad. Still, this ain’t rocket science. 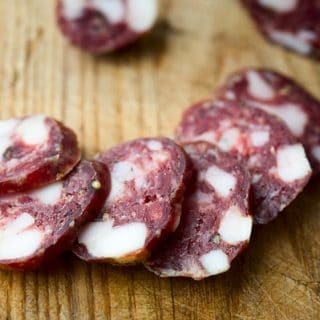 You can make salami at home, and when you do, it is one of the most satisfying things you can make with your own two hands. This is my master recipe for making salami. It works well with most meats, and over the years I’ve done it with pork, wild boar, venison, duck, goose, bear and lamb. The fat is always pork fat, with rare exceptions. If you have something against pork, use the fat trimmed from lamb or beef steaks and roasts, not suet or kidney fat, which is too waxy. There is no substituting the Instacure No. 2 in this recipe. Nitrate has been used in salami making for 2000 years, and I don’t intend to break that tradition. And for those of you freaked out by nitrates, know that a serving of spinach or celery will give you 100 times more nitrates than you will get by eating this salami. As for the starter culture, I know it’s a lot. Technically you could cut the amount of culture a a few grams, but you’d need to make sure the meat is really well mixed to get it distributed right. The amount I use is essentially the “better safe than sorry” approach. If you want to use less, that’s on you. Finally, I prefer using really wide hog casings instead of beef middles, as is customary in Italy. Why? They’re easier to cure, and are still plenty wide enough to get a nice slice. I get my wide hog casings, starter culture and Instacure all online from The Sausage Maker. Links to the individual products are below. 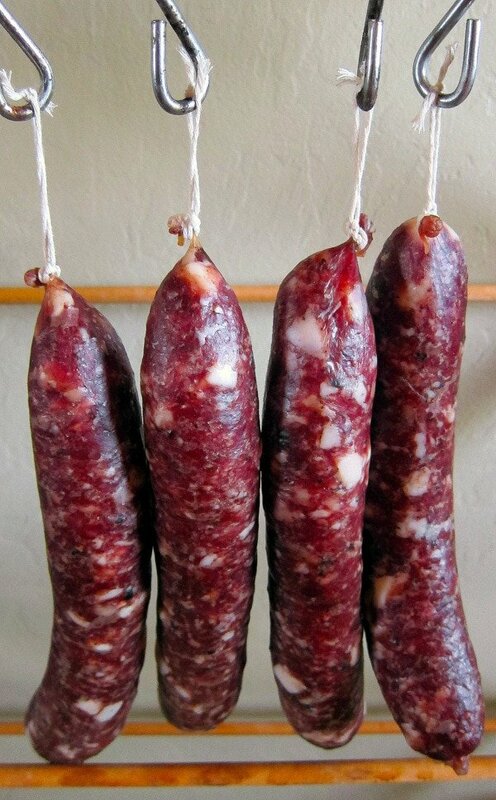 This is a master recipe for making a dry cured salami. To properly make this recipe, you will need some special ingredients: Bacterial starter culture, to make sure the good bacteria beat out the bad ones, curing salt, to protect against botulism, and wide hog casings, which are best bought online. The next day, put the fat and your grinding equipment -- blade, coarse and fine die, etc -- in the freezer. Mix the Instacure, garlic and half the black pepper into the meat. Put that in the freezer, too. Let everything chill down until the meat hits about 28°F or so. It won't freeze solid because of the salt. Normally this takes about 90 minutes. While you're waiting, soak about 15 feet of hog casings in a bowl of warm water, and put the red wine in the fridge. When the meat mixture is back below 35°F, you can mix it. I put the mixture into a big plastic bin with the diced fat, the remaining black pepper, the red wine and the starter culture mixture and mix it by hand for about 2 to 3 minutes. If you do this, you'll know the mixture's cold enough if your hands ache from the chill. Or, you can put everything into a big stand mixer and mix on low for 90 seconds to 2 minutes. I prefer to mix by hand. Pack the sausage into your stuffer and get ready to make the salami. Leave 4 to 6 inches of casing hanging from the edge of the stuffer as a "tail;" you'll use this to tie off the salami in a bit. Start working the meat into the casing, using your fingers to flush any air out of the casing and to regulate the flow. I prefer straight links of about 10 inches to a foot. Remove the link from the stuffer and repeat with the remaining casings and sausage. Now gently compress the meat within each casing, watching for air bubbles. Heat a needle or a sausage pricker in the flames of your stove to sterilize it, and prick the links to let any trapped air out. Tie off both ends of the link in a double or triple knot (you don't need a specialized butterfly knot with hog casings) and then tie a loop of kitchen twine to one end, making sure the twine knot is underneath the casing knot you just made: This will prevent the twine from slipping off. Hang your sausages from "S" hooks or somesuch on a wooden rack. To ferment your links, you will need to keep them warm and moist. I do this by putting a humidifier under the hanging sausages and then tenting the whole shebang with big garbage bags that I've sliced open on one end. I also use a water sprayer to spritz my sausages a couple times a day. Doing this prevents the casings from hardening. Keep your sausages hanging at room temperature (65 to 80°F) for two to three days. Note that prep time does not include curing or drying time, which will take about 45 days or so. Find more recipes for dry cured sausages from all over the world here on Hunter Angler Gardener Cook! I was just wondering if you can use a small percentage of beef with the pork to make salami? I made a salami curing device out of an RV refrigerator box. I bought some control boards that control humidity and temperatures together. I then integrated them into the heating/humidity/venting system The meat will be elk, and the fat will be pork jowls. I have never started a fermentation before, what would you recommend to use to get the fermentation started. I have been reading about slowly matching the temp to humidity number close and slowly decrease them together. I’m in Nevada where outside humidity will never be an issue. It will always be inside a temperature controlled wildlife butcher shop that I built. 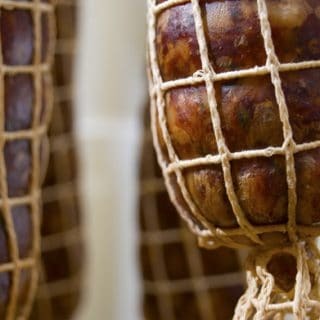 I’ve also heard about making a special link of salami to use for testing for contamination Do you have any suggestions, or pointers on any of this? Am i heading in the right direction? Who would you suggest that I get the fermentation starters from, as well as larger pork casings? I have a bunch of 25-32 mm in stock for regular sausage. Would that work for my first go around? I’m all ears! Thanks! Peta: Yes, you can use pre-frozen meat. Kezza: yes, you can do that.